Synthetic peptide within Human Importin 9/RANBP9 aa 1000 to the C-terminus (C terminal). The exact sequence is proprietary. Fetal brain lysate; human lymphoma tissue. Our Abpromise guarantee covers the use of ab52605 in the following tested applications. WB 1/1000. Detects a band of approximately 115 kDa (predicted molecular weight: 115 kDa). Functions in nuclear protein import as nuclear transport receptor. Serves as receptor for nuclear localization signals (NLS) in cargo substrates. Is thought to mediate docking of the importin/substrate complex to the nuclear pore complex (NPC) through binding to nucleoporin and the complex is subsequently translocated through the pore by an energy requiring, Ran-dependent mechanism. At the nucleoplasmic side of the NPC, Ran binds to the importin, the importin/substrate complex dissociates and importin is re-exported from the nucleus to the cytoplasm where GTP hydrolysis releases Ran. The directionality of nuclear import is thought to be conferred by an asymmetric distribution of the GTP- and GDP-bound forms of Ran between the cytoplasm and nucleus (By similarity). Mediates the nuclear import of H2B histone (By similarity), RPS7 and RPL18A. Prevents the cytoplasmic aggregation of RPS7 and RPL18A by shielding exposed basic domains. May also import H2A, H3, H4 histones (By similarity), RPL4 and RPL6. Overlay histogram showing HeLa cells stained with ab52605 (red line). The cells were fixed with 80% methanol (5 min) and then permeabilized with 0.1% PBS-Tween for 20 min. The cells were then incubated in 1x PBS / 10% normal goat serum / 0.3M glycine to block non-specific protein-protein interactions followed by the antibody (ab52605, 1/1000 dilution) for 30 min at 22°C. 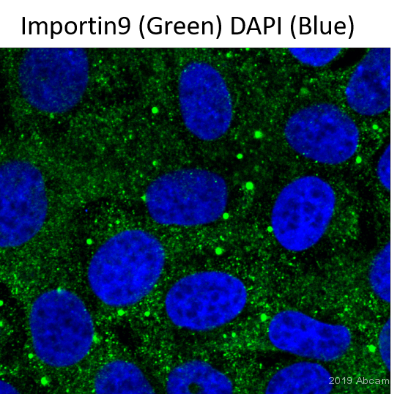 The secondary antibody used was Alexa Fluor® 488 goat anti-rabbit IgG (H+L) (ab150077) at 1/2000 dilution for 30 min at 22°C. Isotype control antibody (black line) was rabbit IgG (monoclonal) (0.1μg/1x106 cells) used under the same conditions. Unlabelled sample (blue line) was also used as a control. Acquisition of >5,000 events were collected using a 20mW Argon ion laser (488nm) and 525/30 bandpass filter. Immunohistochemical staining of paraffin-embedded human lymphoma using ab52605 at a dilution of 1/50. Publishing research using ab52605? Please let us know so that we can cite the reference in this datasheet. 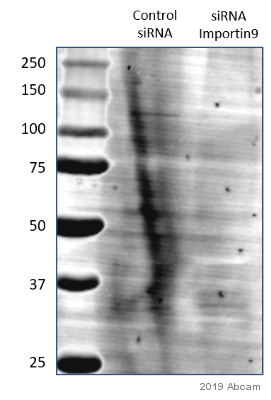 The data sheet for this RanBPM antibody shows a western blot indicating that this antibody recognizes a 115 Kda protein. RanBPM is 90 Kda. Could you explain the reason for this discrepancy? Also, could tell me what is the total amount and type of extract used to detect RanBPM with this antibody on this western blot. I can confirm that ab52605 is against RanBP9 not RanBPM, my apologies for the fact that RanBPM was added as an alternative name on the datasheet, this has been corrected immediately. The detected band's molecular weight matches the predicted MW detailed in the following database: http://www.expasy.org/uniprot/Q96P70 The protocol attached to the datasheet includes the extraction procedure, and I can confirm that 10 µg of fetal brain lysate was loaded (this tissue is purchased commercially and therefore we do not know the exact age I'm afraid). I hope this information will be useful.